Approximately 86 species of marine angelfish live in shallow reefs around the world. Marine angelfish, such as queen angelfish, belong to the family Pomacanthidae, while freshwater angelfish are in a different family, Pterophyllum. Queen angelfish, in the genus Holacanthus, have the species name "ciliaris." The fish were identified and named in 1758, although their scientific names have changed since discovery. They are popular in saltwater aquariums because of their bright patterns and colors. Queen angelfish have electric blue bodies and yellow fins and tail. The fish may have orange or purple highlights. Queen angelfish's royal name comes from their “crowns,” round black-and-blue spot on the top of their heads. They can grow quite large in the wild, reaching up to 18 inches in length and 3.5 pounds. Young marine queen angelfish have much more yellow on their bodies, which turns blue as they age. Queen angelfish are omnivores. Their primary food sources are sponges and algae, but they are opportunistic and will eat sea fans, soft corals and even jellyfish if need be. Juveniles serve as cleaners for larger species of fish, picking parasites off the skin of those fish to eat. This relationship gives young queen angelfish an easy source of food and benefits the larger fish's health. Like many other varieties of angelfish, marine queen angelfish inhabit coral reefs in tropical climates where the waters are warm. Although they can be found in shallows near the shore, they can be found at depths of up to 230 feet. The colorful patterns of angelfish developed to provide some camouflage among the corals and plants that live on reefs. 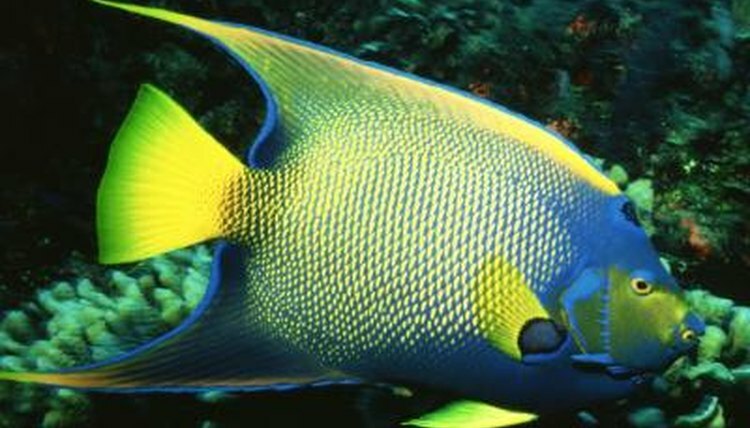 Queen angelfish can be found throughout the Caribbean and western Atlantic Ocean, ranging as far north as Bermuda and as far south as Brazil. Marine queen angelfish are shy; they tend to live alone or in pairs. Because many of the fish do live in pairs, it is thought that they are monogamous and form long-term bonds with their partner. During reproduction, pairs will bring their bellies close together and release clouds of sperm and eggs. A female can release as many as 10 million eggs in a single spawning cycle. Fertilized eggs float in the water for 15 to 20 days, at which point they hatch into larvae with attached yolk sacs for nutrition. Once they use up the yolk sacs, young queen angelfish feed on plankton. After another 30 days, the juvenile fish find homes on the bottom of the reef and begin to feed on parasites. Queen angelfish are a close relative of blue angelfish, another bold blue fish species, and can actually cross-breed with them to create natural hybrids. This is rare among angelfish, as most species cannot interbreed.